Food. Who doesn’t love to eat? And I must admit, I love all foods; fresh-from-the-oven chocolate chip cookies, hot pizza with my favorite toppings, sushi from Blue Fin, creamy macaroni and cheese, a good burger with thin fries, an Italian meal from Limoncello’s, cold cookies and cream ice cream, and more. I could go on and on. But I rarely eat any of the above mentioned. No, I’m a discipline eater who chows down veggie wraps as a splurge, drinks protein smoothies regularly, and fills my daily meals with fruits, vegetables, chicken or fish, and nuts. Many find my food intake boring and don’t know how I can eat this way day in and day out. But to me, it’s easy as I also find many ways to be creative within my own limitations. Spinach, zucchini and mushrooms are a few of my favorite vegetables, while I love every type of fruit that is out there except for coconuts. So why not share a few of my favorite recipes incorporating them? 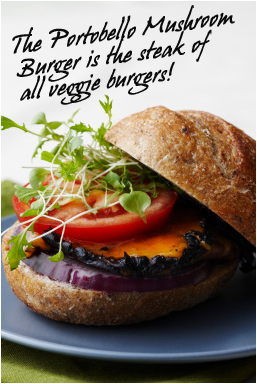 The Portobello Mushroom Burger is to die for. I eat mine without the bun, but please feel free to eat bread if you eat carbs. The avocado sauce is simply delish as is the Zucchini-Tomato Gratin, a family favorite especially with my daughter. The spinach salad is a classic. I have one almost every day as it is my absolute favorite veggie and my favorite leaf base for salads. And what meals is complete without a dessert? Below I share my Fresh Fruit Kabobs recipe with a cinnamon yogurt dipping sauce. Simply yum! I hope you find these recipes as divine as I do. Enjoy! Portobello Mushroom Burger: Brush 4 medium portabella mushrooms with stems removed and 1 medium onion, cut into 1/2 inch slices, with 3 tbsp. olive oil. Sprinkle with 1/2 tsp. salt and 1/4 tsp. ground black pepper. Heat large skillet or grill pan over medium heat until hot. Add mushrooms; cook until tender, 8 to 10 min, turning once. Transfer mushrooms to plate, cavity side up; cover to keep warm. In same skillet, cook onion slices until golden, about 8 min, turning occasionally. Meanwhile, combine in small bowl, 1/2 sliced avocado, 2 tbsp low-fat yogurt, 1/2 tsp minced garlic and 1/4 tsp. each salt and pepper; mash until smooth for an avocado sauce. Spoon onions and 4 roasted red peppers into mushroom cavities, divided equally. Spread smooth Avocado mixture on bottom of 4 lightly toasted hamburger buns; top each with stuffed mushrooms. Top with remaining sliced avocado. Cover with tops of buns. Serves 4. Zucchini-Tomato Gratin: Cut 1 1/2 lb. tomatoes into 1/4″ thick slices; drape tomato slices over colander, sprinkle with salt and let drain 45 min. Spread 2 medium zucchini (1 lb. ), cut into 1/8” thick diagonal slices, on baking sheet and sprinkle with salt. Let stand 30 min to sweat out excess moisture. Rinse well and pat dry. Preheat oven to 375°F. Heat 1 tsp. olive oil in nonstick skillet over medium-high heat. Sauté zucchini 3-4 min or until golden. Transfer to plate. Do this in 2 batches if necessary, adding more olive oil between batches. Layer half of zucchini slices in 8” square baking pan. Top with half of tomatoes. Sprinkle with 2 thinly sliced garlic cloves, 1 tbsp. roughly chopped kalamata olives, 1/8 c. thinly sliced basil leaves, and 1/4 c. Parmesan cheese. Season with freshly ground black pepper. Repeat with remaining zucchini, tomatoes, 2 thinly sliced garlic cloves, 1 tbsp. roughly chopped kalamata olives, and 1/8 c. thinly sliced basil leaves. Drizzle top with 1 Tbs. oil and sprinkle with remaining 1/2 c. cheese. Cover with foil, and bake 10 min. Remove foil. Bake 20 min more or until cheese is melted and gratin is bubbling. Let stand 5 min before serving. Serves 4. Spinach Salad: To make a raspberry vinaigrette dressing, combine the following ingredients in a blender or food processor and emulsify until smooth: 1/2 c. vegetable or canola, 1 packet of Truvia or other stevia-based sweetener, 1/4 c. no sugar added apple sauce, 1 tbsp. Dijon mustard, 3 tbsp. red wine vinegar, 1 tsp. fresh lemon juice, a dash salt and pepper to taste and 1/2 c. fresh or defrosted frozen raspberries. Set aside. For the salad, in a large bowl combine 1 package fresh baby spinach (rinsed and torn into bite-size pieces), 1 cup dried cranberries, 3 /4 cup slivered or chopped almonds, 3 chopped egg, and 4 ounces fresh goat cheese (crumbled). Toss lightly with dressing and serve immediately. Store remaining dressing in an airtight container in the refrigerator. Serves 4. Fresh Fruit Kabobs: Combine 1 c. unflavored yogurt with 2 tsp. brown sugar, 1/4 tsp. vanilla extract and 1/4 tsp. ground cinnamon. Alternating the following fruits – 2 pts. fresh strawberries, 1 pineapple, peeled, cored and cubed, 1 honeydew melon, scooped into melon balls and 3 kiwi fruits, peeled and sliced – by threading them onto 6” bamboo skewers. Serve kabobs with cinnamon yogurt dipping sauce. Makes 24 kabobs. everything sounds delish and the burger looks awesome! Thanks! I hope you try to recipes!